While I think you’re reading too much into this, I do appreciate your simple layout. It suits for living, and if it makes you happy, than your decision was all for the better. Nice bus. I LOVE your bus!!! 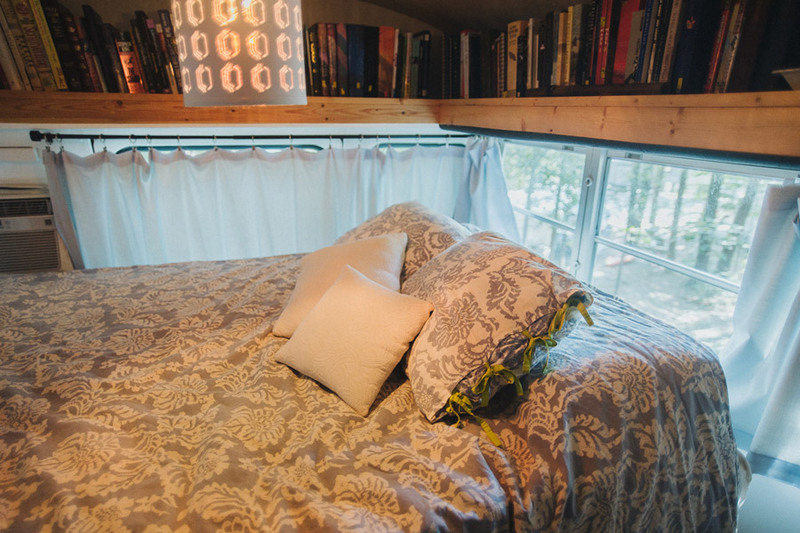 My husband and I have been going back and forth on a house bus or a THOW for a long time now. I love the mobility of the buses and yours is SO beautiful! Where do you park it on a regular basis? Do you have to live in an RV park or do you have other arrangements? Bravo! I just heard over the radio 60% of americans are renters. Scary thought…..one day we will all realize we can once again regain true freedom from beautiful, simple and very inexpensive living. You both are very smart and can achieve any dream thru this way of LIVING! what a work of ART! Perfect home! Let me know when you are ready (if ever) to sell! 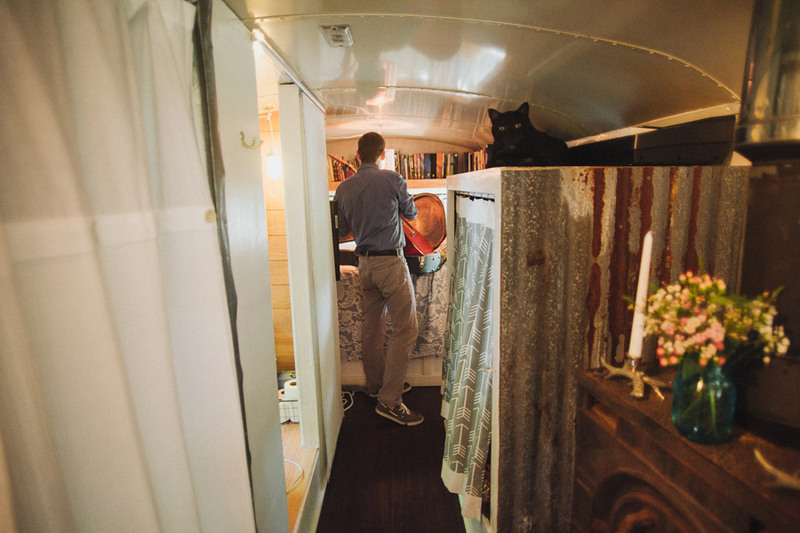 I was wondering how much you spent renovating the bus? Additionally what do your monthly costs look like? 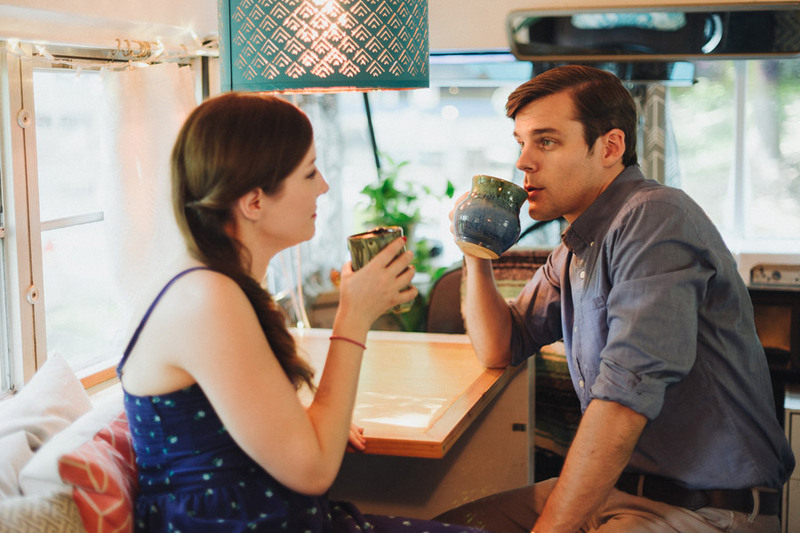 My husband and I are planning on making the switch to living in an RV full time and your bus is exactly what we are looking for. i think that you and Andrew made amazing and beautiful changes and turned the bus into a great home! After much thought and discussion, my spouse and I downsized into a 31 ft class C motorhome. We are enjoying making changes inside that make it uniquely ours, while the exterior still looks factory-fresh. We never tire of the small space. Rather than saying life became simpler, I’d had to say it became more intentional. very beautiful and a lovely way to travel. Bet the dog and cat enjoyed it too. Such a beautiful home! 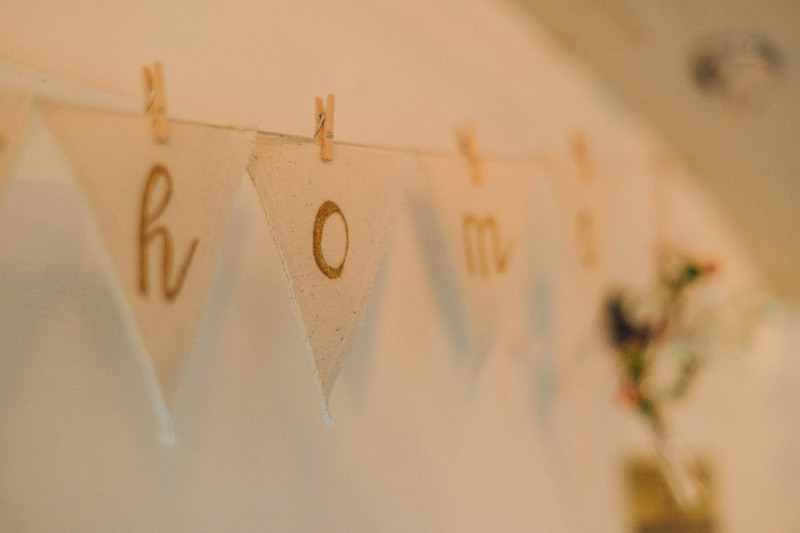 I love all the decorating and homey touches and it seems to be laid out quite well for function. 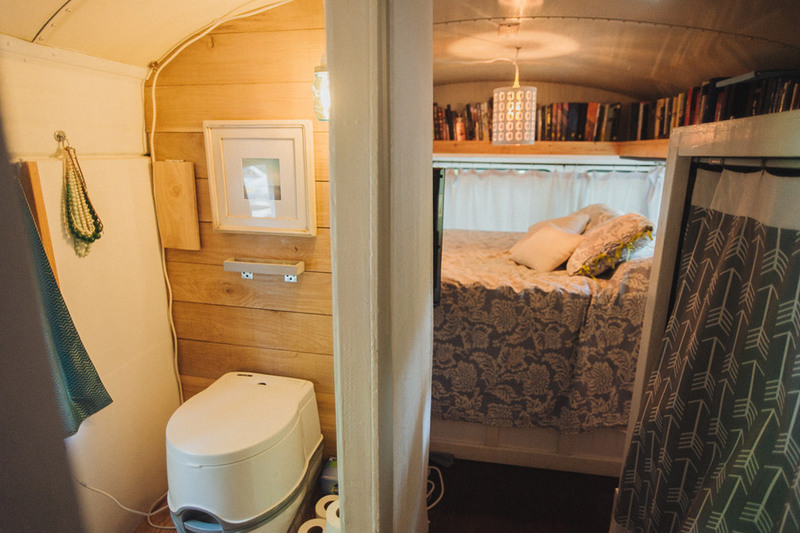 One of the best buses turned tiny home that I’ve seen. I Love you little home!!! This is a dream for me and I am working toward this very thing. Could you tell me where you found your bus? I love the bus. Not only has everything been well thought out but you also have a talent for design. The only thing I would add is to use different clothes hangers. They make those flat kind of felt covered hangers that you can buy anywhere. Trust me when I tell you they will double your closet space. Those plastic tube hangers take up way more space. In the meantime enjoy your adventure. 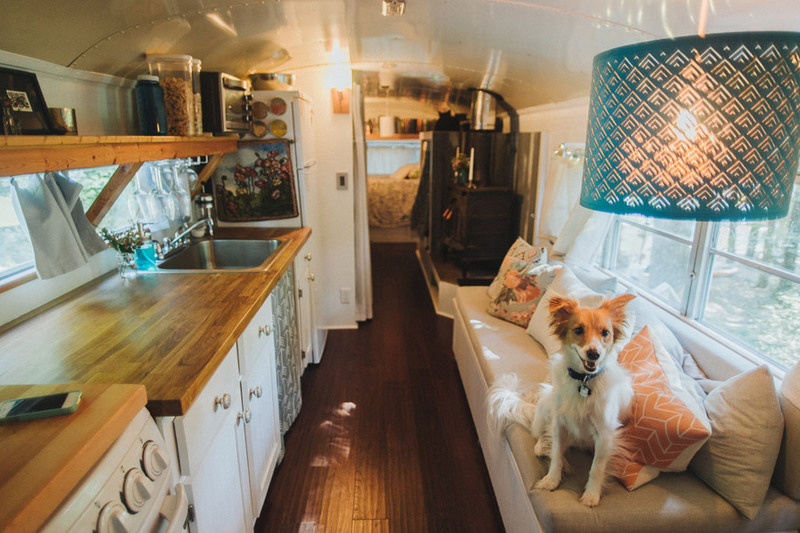 I LOVE THE CONVERSION OF THE BUS INTO A HOME AND ALSO WORKS WHEN YOU ARE TRAVELING YOUR HOME GOES WITH YOU WHERE EVER YOU GO,I LOVE IT GREAT JOB GUYS. Love the bus…you did a wonderful job on the renovation! Coming to take Starbuck what a nice well behaved doggie. My PattiCake (standard poodle) is in a 6 week reform school to help her remember how to be a sweet girl….. Enjoy your life and may it hold many many blessings! If you get married and have kids you’ll be a buswife. and now have a ton of followers. 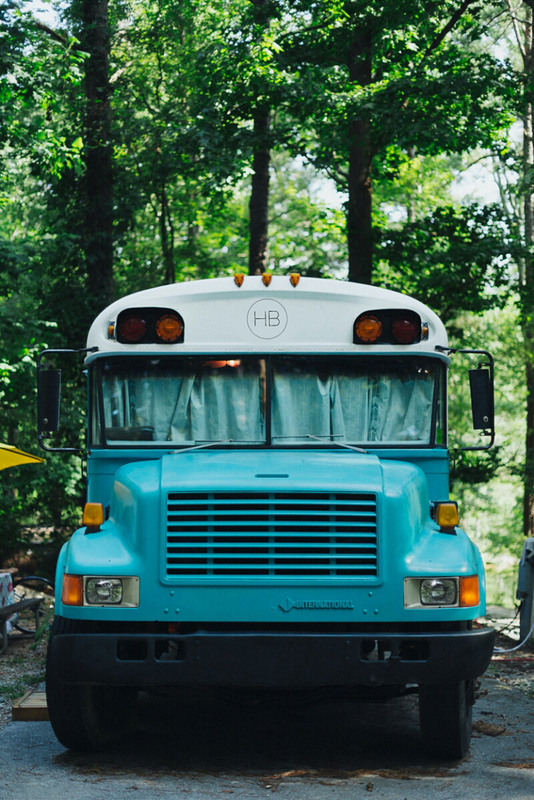 Pingback: Julie and Andrew’s Converted School Bus Home | Buzoo!